Stephen Verwers of Hawaii dunked for two of the eight points he scored last night against Idaho. Hawaii began its final homestand of the season by avenging one of its most frustrating road losses of the season. The Rainbow Warriors didn't let their second meeting with Idaho come down to another dramatic conclusion, running away from the Vandals for an 81-64 win last night at the Stan Sheriff Center. The Rainbows won their third straight to enter tomorrow's regular-season finale against Boise State at 17-12 and 7-8 in Western Athletic Conference play. Idaho lost its 11th straight to fall to 3-25 and 1-14. Seniors Ahmet Gueye and Matt Lojeski will be honored at the conclusion of tomorrow's senior night contest, as will Riley Wallace as he makes his final regular-season appearance at the Sheriff Center as head coach. "We've got an important game, this is for seedings and standings for the tournament," forward Bobby Nash said. "We just want to play our best basketball and then go to the tournament with a full head of steam." Matt Gibson fell to the floor while trying to draw an offensive foul on Keoni Watson of Idaho last night. The Vandals stunned the Rainbows with a last-second 3-pointer in their only WAC win of the season on Jan. 18. With senior night and Wallace's final regular-season home game looming, maintaining focus was a key and the Rainbows put last night's game away early. UH coach Riley Wallace expects a tougher time tomorrow when Boise State (16-12, 8-7) visits the Sheriff Center. "They've got players and it'll take a 40-minute effort Saturday to beat them," Wallace said. UH guard Matt Lojeski led three Rainbows in double figures with 20 points on 6-for-10 shooting. Nash finished with 15 points, five assists and five rebounds and Matt Gibson had 10 first-half points as UH took a 19-point lead at halftime and led by as many as 28 in the second half. "It's nice to know that we didn't have to grind it out like we did up there," Lojeski said. "If you let a team get some confidence and stay with you ... they start doing things they don't normally do like they did at their place,"
Though the Rainbows controlled the game, Idaho guard Keoni Watson showed he had the game to match the shine of his gold and black shoes. Watson gave the 'Bows fits with his quickness and accounted for 10 of Idaho's first 14 field goals on his way to a career-high 34 points -- the most by a UH opponent this season -- on 14-for-27 shooting from the field. He finished four points short of the Sheriff Center record. Keoni Watson of Idaho got a shot off against Ahmet Gueye, Matt Lojeski and P.J. Owsley of UH. Watson scored 34 points. The speedy 5-foot-10 senior, who was born at Kapiolani Medical Center and moved to the mainland at a young age, even earned the applause of the UH crowd after hitting back-to-back 3-pointers in the second half, then getting an improbable running scoop shot to drop. He was given a standing ovation when he left the floor for the final time. "Wow, that was a better standing ovation than I got in Idaho," Watson said. "Especially coming from Hawaii, it felt good. It really did." "He's quick and he's become a better shooter than he was last year," Lojeski said. "He was carrying his team." All eight UH players who took the floor in the first half scored as the 'Bows sprinted away from the Vandals to take a 45-26 lead into halftime. UH's first-half total was a season high. Watson represented the bulk of the Vandals offense as the 5-foot-10 senior went into the break with 18 points. No other Idaho player had more than four points in the half. Hawaii made its first five shots from the field, the first four coming off Nash assists, with Gibson dropping in two of UH's three 3-pointers in the opening 13-4 surge. "They shot the snot out of the basketball in the very beginning," Idaho coach George Pfeifer said. Note: This year's class off inductees to the Bank of Hawaii Circle of Honor was honored at halftime -- late statistician and benefactor Bob Nagatani, former all-conference football player Joe Onosai and the 1955 UH football team. 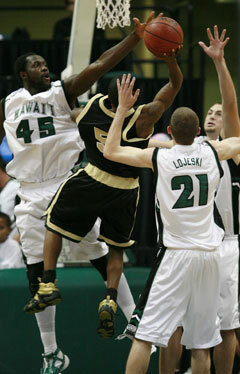 Halftime -- Hawaii 45, Idaho 26. 3-point goals -- Idaho 6-20 (Watson 4-10, Morris 2-4, Nagle 0-1, Avworo 0-1, Webb 0-1, Jackson 0-1, Crowell 0-2), Hawaii 8-13 (Nash 3-5, Gibson 2-2, Waters 2-4, Lojeski 1-1, Luettgerodt 0-1). Personal fouls -- Idaho 27, Hawaii 18. Steals -- Idaho 6 (Nagle 2, Watson 2, Johnson, Avworo), Hawaii 2 (Gueye, Lojeski). Blocked shots -- Idaho 4 (Johnson 3, Nwoke), Hawaii 4 (Gueye 2, Owsley, Lojeski). Turnovers -- Idaho 13 (Watson 3, Avworo 3, Nwoke 2, Johnson, Nagle, Crowell, Jackson, Madsen), Hawaii 15 (Owsley 3, Gueye 3, Lojeski 3, Waters 2, Nash, Gibson, Luettgerodt, Verwers). Officials -- Rick Batsell, Winston Smith, Bill Kennedy. A -- 4,090.